The Budweiser Made in America Festival will return to Philadelphia for its fifth year this Labor Day weekend and the lineup is, once again, incredible! Rihanna and Coldplay are set to headline the festival, which will be held on September 3 and 4 and is curated by Jay-Z himself. In addition to them, other artists coming out include, ColleGrove (2 Chainz and Lil Wayne), Chance The Rapper, DJ Khaled, Bryson Tiller, Gary Clark Jr, Travi$ Scott, SZA, A$AP Ferg and more. 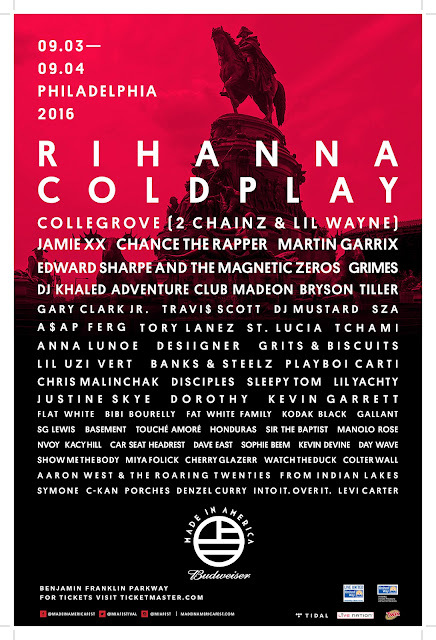 Will you be attending Made in America?